Any parent with a little girl understands the frustration of combing knots from their daughter’s hair. It is a time-consuming chore and is rarely done painlessly. The Knot Genie can change all that! 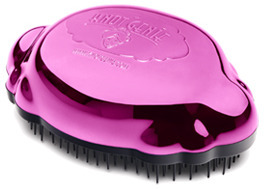 The Knot Genie has been fashioned to brush hair of all types and textures gently and with little effort. The bristles are engineered to glide through the hair with ease, loosening knots and tangles, and making brushing hair a pleasure to brush and style rather than an endurance test for both parent and child.